Never FEEL TIRED, only GET TIRED! 'Work, tiredness and rest.' These three words are the golden words of human beings.There are three essential things required for every person in this world - food, shelter and clothing. 'Work' is the solution to get all the three essentialities. Every individual in this world has to WORK in some or the other way. The amount of WORK determines the way in which they will live their Life. 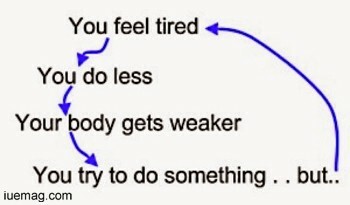 There is a lot of difference between 'Getting tired' and 'Feeling Tired'. Getting tired is when you have actually given a good amount of work to your body because of which it requires some rest. Feeling Tired is just a 'feeling' of tiredness when your body is actually not tired but your mind says it is tired. Most of us would have experienced this and some may be experiencing it even now. Whenever your mind says 'tired', ask your body once and confirm it by giving a task to your body. Give rest to your body only if it says, "I am DONE!" I used to experience 'feeling tired' psychology before and I can now see that I have wasted ample amount of time because of that. So, I would like to suggest all those who experience this on a regular basis to get out of it and start giving justice to each minute of your life by assigning work to your body when needed and rest to your body when it requires. "You will understand the true meaning of REST only when you give rest after having WORKED HARD enough." Any facts, figures or references stated here are made by the author & don't reflect the endorsement of iU at all times unless otherwise drafted by official staff at iU. This article was first published here on 13th November 2014. Vishwesh Wali is a contributing writer at Inspiration Unlimited eMagazine.